Scuba Schools International announces Scuba Rangers Adventure Week with Divetech at Cobalt Coast Resort, August 4 ­ 11th, 2007. 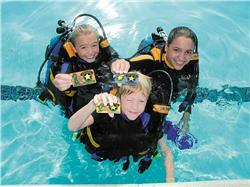 This will be a fun-filled week for Scuba Rangers and their parents. Under the supervision of highly trained instructors, the Scuba Rangers will complete underwater missions diving on shallow reefs filled with a variety of Marine life. They will earn Specialty ratings including Computer Ranger, Stingray Ranger, Marine Life Ranger, Maze Ranger, Underwater Scooter Ranger, Photo Ranger and Navigation Ranger! Everyday will be filled with amazing adventures. While the children are off enjoying themselves, the parents will be able to experience world class diving in locations such as North wall and Northwest point where sheer walls and hundreds of dive sites await you including world famous Stingray City! In addition to morning boat trips parents will have access to unlimited shore diving at two awesome locations. Situated on the pristine Northwest tip of Grand Cayman, Cobalt Coast Resort is an intimate owner-operated location that boasts a numerous amenities such as complimentary wi-fi access, fresh water pool and Jacuzzi. The award-winning staff is on hand to make sure all guests are completely satisfied. "It's all about family vacations and families diving together. The Scuba Rangers program has been supported by Divetech since it was released; we were the first International Scuba Ranger Center to offer programs for Ranger kids to dive. With our warm waters, no currents, awesome visibility and abundant marine life just a minute off shore, the kids will have an awesome time diving with lots of cool fish". It's continuing education with the Rangers certified at home and then we get the privilege of taking them on ocean dives. It gives SSI shops an option to help sell the Rangers programs over the winter, then book a vacation for the whole family." states Nancy Easterbrook of Divetech.